Shopping for Battlestar Galactica Action Figures? Join your heroes on board the Battlestar Galactica! 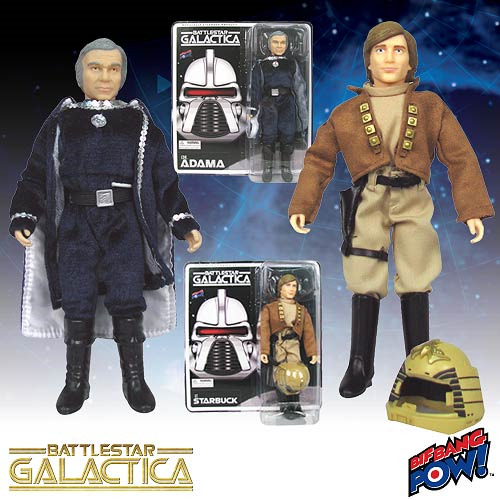 Retro-style action figures of Lieutenant Starbuck and Commander Adama. Direct from the sci-fi television series Battlestar Galactica. Feature multiple points of articulation and episode-specific fabric clothing. Direct from the 1978 science-fiction television series Battlestar Galactica, these 8-inch scale action figures feature multiple points of articulation, episode-specific fabric clothing, and a retro style reminiscent of the bestselling "Mego" action figures of the 1970s and 1980s. Continuing Bif Bang Pow! 's successful partnership with EMCE Toys, they bring the show's most popular characters to 3-dimensional life for BSG fans new and old! Ages 14 and up. Featured here is Viper-pilot hotshot and notorious gambler and womanizer, Lieutenant Starbuck of the Colonial Service, as played by actor Dirk Benedict. Clad in authentic pants, jacket, belt, and boots, Captain Apollo's best friend brings his excellently detailed removable helmet and pistol accessories to the party. Actor Lorne Greene artfully portrayed the able commander of Galactica and spiritual leader of the surviving colonists on board her. Here, Commander Adama brings a microphone accessory and appears in a removable cape of blue and silver velvet fabric with silver plastic accents and belt buckle, and black plastic belt and boots. The inside of his cape is white. Battlestar Galactica (BSG) is an immensely popular franchise of television series and sci-fi films, the first of which aired in 1978. Books, comic books, and video games followed. In Battlestar Galactica, The Twelve Colonies - a civilization of human beings in a far-off sector of the universe - are at war with the cybernetic Cylons. The Cylons lay waste to The Colonies, decimating their worlds and populations, and the survivors flee aboard any spacecraft they can find, including the Battlestar Galactica, the only military ship in the Colonial Fleet to survive the Cylon attack. Battlestar Galactica's renowned commander and his crew then lead the ragtag flotilla of survivors in search of a new home, the mythical planet Earth.